The spirit of volunteerism touches hearts—both the young and the old. Nicholas Kircus is among the community volunteers who help to keep our Garland Community alive and well with his labor. 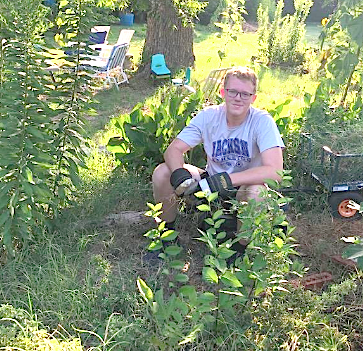 Nicholas, an honor student, has been coming to the garden at 7:30 in the morning and working for an hour before football practice pulling the relentless Bermuda grass from our beds. Without volunteers like Nicholas, our community would not have nearly so many nice places like the garden and public services such as the Good Samaritans—most volunteers work behind the scenes unseen providing valuable assistance the rest of us never see. It is especially heartening to see our youth involved in community volunteerism as the patterns we set in our youth are often with us throughout our lifetimes. Nicholas is a young man who appears to be living a life of balanced responsibility and discipline. After he leaves the garden between 8:30 and 9 AM, he goes on to football practice at North Garland High School. Nicholas, a senior this year, plays center for the team. I asked him this morning if he had picked out a college to attend after he graduated. He has narrowed it down to two: Texas A&M and Oklahoma University. In addition to caring about his community, Nicholas is also an honor student. Either school will be lucky to have such a responsible young man among their student body. This morning I was thinking when I was down at the garden watering and harvesting some produce to take to Good Samaritans tomorrow about the blackberry bushes in the garden. 25 of the 30 blackberry plants we have at the Garland Community Garden came from shoots of four blackberry plants in my own front yard. In addition, I have donated 30 blackberry plants over the past three years to Loving Garland Green’s various plant sales. It’s amazing the outreach to the community that these four plants have achieved. And of course, in a very organic way as steward of these plants, I too am connected to these plants and to the web of my community. After watering at the Garland Community Garden, I was home and picking some blackberries from the bushes in my front yard when I thought of this connection again. 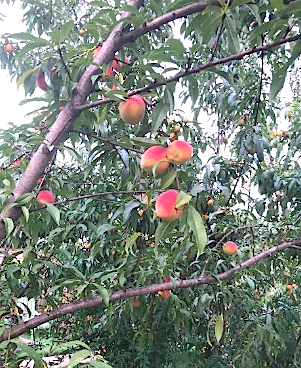 I was watering my three peach trees, which are loaded to the max this year, when two beautiful Japanese women stopped to talk. I think they were tourists. Their English was limited and my Japanese nonexistent, but somehow we communicated any way. Once again I forgot to take a photo. (I guess the heat was making me light-headed.) One of the women asked for a healthy peach, or so I thought. She was actually asking for a branch that had a healthy peach on it. Finally I understood and gave her a branch that had a healthy peach on it. Either I was mistaken about the two women being tourists or perhaps they were going to graft the branch onto a tree of the person they were visiting somewhere here in the neighborhood. Again I thought of connections to Garland and to my neighborhood in particular. Perhaps this is the only opportunity for my immortality. I’ll live on through the plants I’ve shared with others. These two women randomly stopping to talk reminded me once again of that time back in May and June of 2013 when I dug up my front lawn and planted a garden. My back yard is a forest so I decided to dig up my front yard and replace my lawn with a garden, more or less modeled after a woodland forest garden. In 2013 I had lived in my home for 9 years. At least once or twice a week I was in the front yard, mowing grass or pulling weed or fertilizing the lawn and not one person ever stopped by to chat. During the first week of my efforts at digging up my lawn, several people, complete strangers, stopped by to talk with me. After that first week I started keeping track of the number of people stopping. From about mid May until the end of June 2013, I counted 112 people who stopped to talk with me. 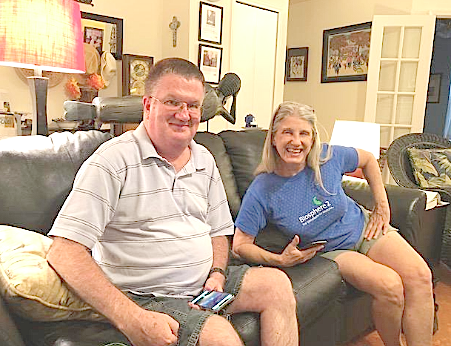 July is filling up fast with volunteer activities for me here in Garland, Texas. Two days ago on Monday we held our first get-acquainted Garland Area MakerSpace Cluster group at my home--Eco Makers. Although the material we will explore will not be limited to plastics, plastic will likely be a prominent feature among our materials that we use to make items. In fact we plan to explore how recycled plastic might even become the product itself. It's possible that recycled plastic could grow into the rate of exchange for membership fees in our Makerspace. According to an Israeli study undertaken in 2012 known as the 5x2 initiative, there is a strategy that organizations can follow to multiply the impact of collaboration that includes the following factors that I’ve applied to our worldwide problem of plastic waste as follows. Some of our recycled plastics will of course be used as materials for local makers too. It might be possible that recycled plastic becomes the currency to pay for our building, operating expenses and tools--thus making membership free. The sale of our recycled plastics to third party customers would be the source of this capital. Yes, like any new manufacturing business, it will take some time to get established but the possibility with all its potential is there. In keeping with our garden policy as a national wildlife habitat we are already preparing for the fall when snakes and mice (food for snakes begin to seek refuge from the cold in compost and brush piles. 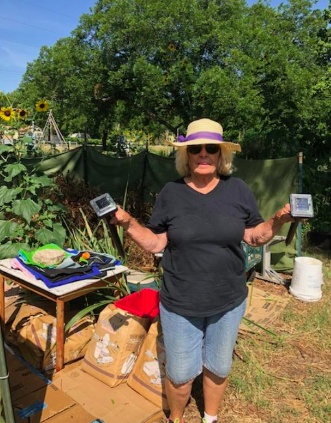 Yesterday (Tuesday July 10) Jane and I installed two solar-powered ultrasonic repellent devices at the Garland Community Garden. We will be inserting many other brands of these devices at the garden. These devices are safe for use around pets and children. They have no troublesome chemical or nuisance pesticides, no trap resulting in dead animals to deal with. This particular device sends out vibrations and sounds every 30 seconds which are said to effectively repel snakes, mice, moles and raccoons. We want to keep the critters in the riparian area that border the garden, in between us and the creek. Free Prosthetics for People all over the world! I attended another great meeting of the Garland Area Makerspace and as usual, learned a lot. Artie Moskowitz brought the parts of several prosthetic hands for us assemble. 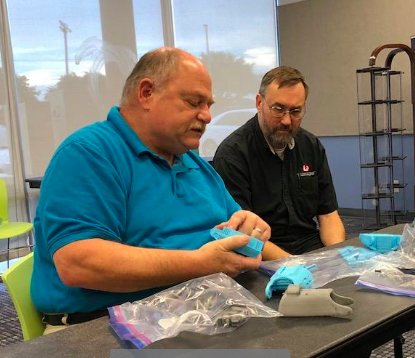 In addition to building the hands we also learned about the nonprofit group E-NABLE who support efforts to build prosthetic hands for people all over the world. Most of the people who are recipients of these prosthetic hands are children who otherwise would never have such a device. This is true even for children in the USA. Often insurance companies won't pay any part of the expense of a prosthetic for a child because they will outgrow it. The beauty of these hands is the cost is nominal at no more than $15. On the more inexpensive 3D printers, it takes about 8 hours to print out the part. Once you get the hang of it, a prosthetic hand can be assembled in an hour. Ivan, showing his metal hand in the foreground. The story of N-EABLE is another story of the difference that one person can make in the lives of so many. 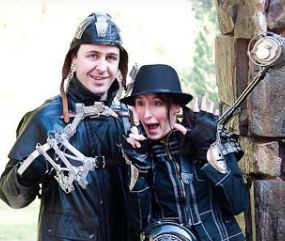 In 2011 Ivan Owen created a crazy metal functioning hand to wear to a steampunk convention. Afterward, Ivan decided to make a you tube video of it. That video led to an email to Ivan from a carpenter in South Africa who had lost his fingers. That led to a collaboration across 10,000 miles for a year to create a replacement finger for him. That then led to the mother of a 5-year old boy contacting them to see about the creation of a small version of a hand for a little boy named Liam who lives in South Africa who was born with no fingers on his right hand. Instead of patenting the design for this new hand and making a profit, Ivan decided to publish the design files as open-source and public domain so that not only Liam could have a hand but so that people could download and print these devices for anyone that needed one too anywhere in the world. E-NABLE started with about 100 people who were simply offering to print files on their 3D printers that were already in existence. Then designers started joining and innovating, collaborating and re-sharing the improved design back into the universe. Within the first year e-Nable community grew to over 3,000 people who create over 750 hands for people around the world. All these 3D printed hands and arms are free to the end-users thanks to volunteers. Turns out you don't have to be a geek to make one of these hands. In fact, teachers are teaching school children how to build these hands for other children. Artie mentioned last night that he would be happy to teach some teachers here in Garland how to do this. He has plenty of experience. Not only does he own his own 3D printer company, Artie has himself printed and assembled over 50 prosthetic devices for people all over the world in the past couple of years. Today was a quiet Fourth of July for me as there was no downtown Parade in Garland Texas. I miss that. Firewheel just isn’t the same feeling of old time Americana that we get in downtown Garland. I really prefer the feeling of small town local when it comes to the Fourth of July. I remember a great Fourth of July a few years ago with my family. There was the wonderful parade and then the festivities continued in Central Park. It was so nice. No one was in a hurry and it didn’t feel crowded. I would like to see those kinds of celebrations again and I’ll bet a lot of people are with me on this opinion. 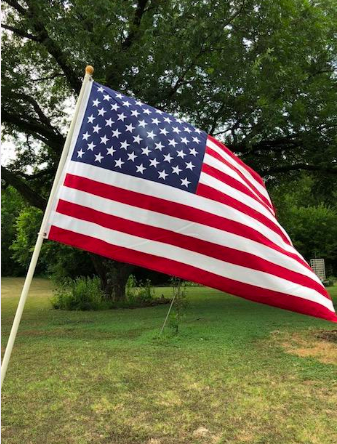 Old Glory flew down at the Garland Community Garden today. In lieu of a parade, I took our flag down to the garden and spent a few early morning hours futzing over the plants. Most of the blackberry bushes are spent so there was pruning to do and of course watering—always to be done in this weather. I enjoyed chatting with my friends Burgi and Jane who were also there. Then I came home and finished reading ELPASO, a large and somewhat historical novel written by Winston Groom, also author of Forest Gump—an interesting story that I would give a B-. 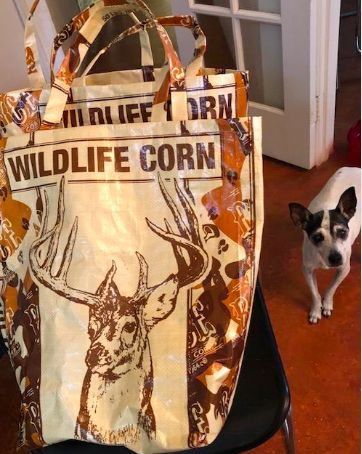 After that I made three shopping bags from feed sacks I got at Roach’s last week. Bubbles decided to get in the photo too. As part of my research for Eco Makers (a maker cluster segment of Garland Area Makerspace), I continued reading about recycled materials—plastics in particular. Plastics and gardening are inexhaustible topics. Even if I had two lifetimes it’s not likely that would be enough time to learn all there is to know about either plastics or gardening. There is much to learn; however, both topics although seemingly polar opposite may be closely linked to our survival as a species. While 80% of plastics can be recycled, only 10% is recycled. We have some work to do. We are about in the same neighborhood when it comes to food and protecting the environment that grows our food. 95% of the food we eat is grown in soil. Today 33 percent of the Earth’s soils are considered degraded (symptoms include increased crusting from overuse of herbicides, increased erosion often from overuse of herbicides, decreased nutrient cycling, and increased desertification). All symptoms of degradation result in a decrease of a given soil to support the full potential of a plant. Another thing about gardens is that urban gardens in particular will become increasingly important for communities as we move deeper into the 21st century. Community leaders need to wise up with their codes and write a few new ones—not nitpicking rules about whether someone’s lawn is up to snuff but rules that really do make a difference such as not allowing residents to haul off organic matter such as leaves from their yards. Leaves should remain as close as possible to where they fall. They can be mulched and doing is a lot less labor than raking and bagging them to be hauled off to a landfill where they will be taken out of the natural cycle and sequestered for hundreds of years. Those leaves represent organic matter for future topsoil. Much of the soil that is left will eventually be carried away and down our storm sewers through erosion. Another good rule might be to put some limits on the amount of herbicides and pesticides citizens can pour on their lawns and plants. They aren’t the only ones they hurt when they do this. Cities all over the world are becoming pesticide free zones. Paris is one of those cities. After 10 years now, the dense urban area of Paris has more honeybees than its surrounding agricultural areas that also follow the industrial monoculture type of agriculture practices found in the USA. We are leaving our children our legacy of waste. If nothing else, it seems like we should do all we can to teach them how to clean up some up our mess: how to recycle plastics and how to reduce use of it as well as how to grow some of the food they eat. When people grow some of the food they eat, they are more aware of the interrelatedness of their behavior to the cycle of life.